Ideal for Local Government and Public Works Users Needing a Durable and Compact Mobile. The APX1500 Delivers a Budget-Friendly P25 Phase 2 Solution. 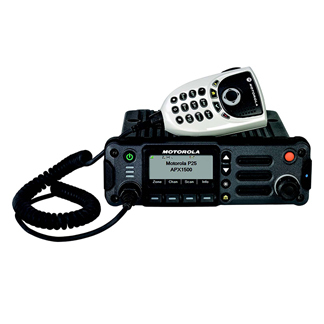 The APX 1500 provides a complete and complimentary look and feel to the APX family of P25 TDMA radios. With its seamless interoperability and extended range, the APX 1500 is engineered so that your crews can be connected, wherever the mission takes them. With the compatible APX O2 Control Head and features like intelligent lighting and an enlarged multi-function knob, the APX 1500 is the ideal solution for local government and public works users who require quality P25 functionality in a compact mobile. The multi-function knob on the compatible APX O2 Control Head is designed for ease of use by combining volume and channel settings.